Recently we’ve written a number of articles on aging beer in your personal cellar, and so this topic has been on my mind a lot. I also just started teaching again after the winter break. One of the classes asks students to look at some of the more symbolic forms of creativity that go on from a day-to-day basis. All of a sudden these two worlds (art and beer) conceptually collided, as they will occasionally, and it hit me that collecting beer, storing it away, making cellaring space in your basement is certainly a form of artistic expression. Perhaps the collector has not thought of what they do in these terms but I’d like to explain where my head is at here, and I have to go on a tangent or two to make sense of it. In 2009 my wife and I went on a 10,000 mile road trip. We started in Portland, drove to Michigan and then up into Canada, cross country to the Yukon Territory before heading into Alaska and then back down the Canadian coastline. In the Yukon we had the opportunity to try to drive up to the Arctic Circle but after a couple hours we were afraid our little car wasn’t going to be able to handle it. We decided to stop, so we got out of the car and went on a little walk in the sub-arctic tundra. I grabbed a twig off one of the plants as a memento and the little branch has sat in the windshield of our car ever since. At first the twig was purple, green, orange, and red but overtime it turned brown, and is now quite frail. I kept it in the car because every time I look at it I think about that three-month period of my life, looking back it is my favorite time. About a year ago my wife asked me if we could get rid of the branch because, frankly, it’s getting old, messy, and it’s not really that pretty any more. I said No Way, there’s no chance in hell that I’m getting rid of that plant, it reminds me of some of the best times ever, how could we get rid of that! Just yesterday I thought of a way that I could get rid of this old plant. I could place it in our compost where it would break apart and turn into black soil. Every spring we add our compost soil to our raised bed planters and we grow a number of vegetables. I like the idea that this very special branch from the Yukon, in a symbolic and physical way, would become a part of the food that I eat and thereby become a part of my body. A little hippy? Yes, I know, I am who I am. I’m going to compost the twig this weekend. Why couldn’t I get rid of the twig before this? Why would it have been so devastating to throw it away when it got ugly? I think there’s more to it than just saying “It has sentimental value.” I think that I need a significant reason to replace it, some sort of symbolic and powerful action. For the twig to be thrown away is saddening, but for it to become part of my own body, on the other hand, is moving and I can be very happy with that. I collect all sorts of things like this. I will often remove posters off walls and bulletin boards if I like something about the design or typography of the poster. I then put the removed poster into a stack of other removed posters. Some day, some day, I know that I’m going to be glad that I held onto these things, I know that I’ll use the things I’ve collected in some project I’m working on. But until that day my posters will lay in a stack in my bedroom, another stack at my office, I’ll have a few things scattered here and there because that’s where I need them. They remind me on a regular basis that there’s some idea slowly fermenting away in my brain, and soon it will all come together. When that day comes I’ll be able to file them away permanently, perhaps recycle them, just as I’m now able to compost the twig. All this to say that I have come to the conclusion that collecting is an act of creativity, not just an impusle. We collect things that make sense to us. On Pinterest we collect pins and put them all onto a wall. On occasion you might look at your Pinterest Recipe Wall and one simple image reminds you that “Oh yeah, I really wanted to make these cookies one day.” And then you go to the grocery store to buy ingredients. Our collections are like this, a set of objects and images that are embedded with meaning and story. They may not make sense to other people, but to ourselves they are an ever changing expression of who we are at that moment. Some people might balk at calling these collections Art. But I’m an art teacher and I believe I have some say in the matter. As an artist I find more beauty in the daily creative forms that make us who we are – even if this creativity is subconscious – than in the creation and worship of masterpieces. Right…beer! I know many people who have really fantastic bottle cellars at home. 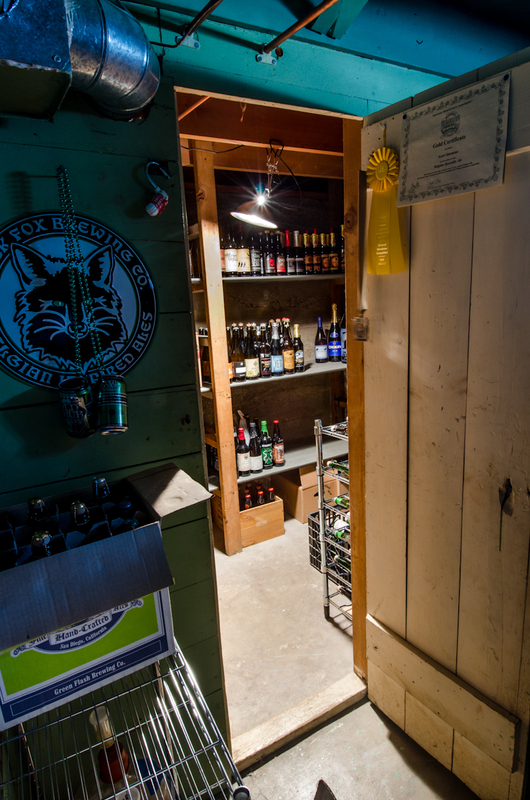 They’ve built a system of organization, a temperature controlled environment, they have hundreds of bottles of beer, and all of these are manifestations of the human impulse to be creative. My friend Scott, who writes on this blog likes to collect sour beers, Josh on the other hand tends to have more Russian Imperial Stouts. Scott likes to get rare beer that isn’t available here, Josh does too but also has a significant collection of Stone beers that are easily available throughout town. My friend John keeps a small collection of bottles and all of them are Barleywines, a significant amount are Sierra Nevada Bigfoot. Another pal DING, who I only know online, has decided to whittle down his massive collection because he’s grown disenchanted with the marketing and hysteria of Craft Beer. Other’s disagree, but that is his own viewpoint and his collection reflects his worldview. Perhaps most intriguing to me is the decision to open a beer. Much like my inability to get rid of the Yukon twig until I knew that the symbolic significance of it’s absence would be greater than it’s current presence, so too the collector has aesthetic and symbolic decisions to make on when to open, or get rid of, certain bottles from the collection. In our interview with Lauren Salazar she said that she prefers to drink beer at it’s freshest, but does have a collection of bottles and when friends come over they are allowed to open any bottle they want. Lauren can’t stand the idea that certain friends would be judged not-worthy of a particular beer in her possession. Another friend has a set of rules, which seems to have developed out of Beer Advocate bottle shares, that the person who brings a special bottle is the one to open it and they get the first pour. I know people who save beers until they have five vertical years in a row. I know people who just have a gut feeling that a particular night with friends is the right night to open a special bottle of beer they’ve held onto. I know people who organize bottle opening parties. When Isaac announced he got a job in Oregon, he brought over a stash of aged Oregon beers. It was the perfect way to celebrate his job, and he knew it was the perfect timing to open those beers. Personally, I am bad at storing beer away but I do always purpose to open a bottle of Deschutes Abyss on New Year’s Eve, and I always drink at least half the bottle myself and share the rest. These decisions are all creative decisions even though they seem so small, insignificant, and/or attached too much to consumerism. The fact of the matter is we all have this human need, however subconscious it might be, to be creative and that creativity is going to find a way to come out of it’s shell at some point. Not sure that this post is of any significance to our readers or not. However for my art students this conversation can be a beautiful reminder that “Everyone is an artist” and that it can be wonderful to find value in that statement.